Living and working in Canada is a life changing experience. The country is the 2nd largest in the world (based on area) so boasts a spectrum of beautiful forests, spectacular mountain ranges, bustling cities, impressive flatlands and ice-fields. It has chilly, snowy winters and baking hot summers and constantly finds itself featured in the top countries to live in the world, according to the United Nations Human Development index! Canada is a country that we love here at Oyster Worldwide. So much so that since 2000 we have built links with employers in Whistler, British Colombia, Banff and Jasper, Alberta and Tremblant, Quebec. Each destination offers unique experiences and glimpses of Canada. This guide will manifest the places to go, tips and hints to know and reasons why Canada remains such an endearing country. Vancouver. The western gateway between Canada and America. It is the warmest city in Canada and is a major point of landing from Asia, the Americas and Europe. It has a young, vibrant, slightly edgy feel to the city, with underground bars with live music like Roxy’s on Granville Street to the craft beer microbreweries and eateries of Gastown. This city showcases locations like the immense Stanley Park, the seawall and Vancouver aquarium, making it a great place to walk around and explore. Oyster Worldwide send workers from around the world to the world-famous ski resort nearby Whistler Blackcomb, regularly voted #1 in North America. Due to its’ proximity to Vancouver, many residents come up the Sea-to-Sky Highway to the slopes to shred the world renowned deep Canadian ‘pow’. Locals and seasonaires can get a cheap return bus between Whistler and Vancouver for $35. 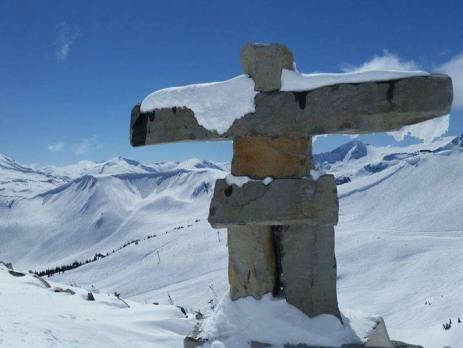 In 2010, Vancouver was the host city for the Winter Olympics, with many events taking place in Whistler and enjoyed by Oyster participants. The temperature in Whistler isn’t as cold as central Canada, but you can still expect lows of nearly -20°C. The 2016/17 season saw over 11 meters of snow fall! The runs vary from intermediate to hard with a wide range of terrain types including; twisty tree runs, glacier runs and knee-high moguls and, if you’re feeling brave, everyone’s favourite ‘Air Jordan’ drop. Moreover, if the snow quality doesn’t entice you then the beautiful views and crazy après will. Mondays at Tapley’s, Tuesday at Cinnamon Bear, Wednesday at Bill’s and so on, you are spoilt for choice. In some of these locations you can do a bit of celebrity spotting too; spying the likes of the Beckhams, Trudeaus and other A-Listers. If the local partying doesn’t tempt you, then the award winning restaurant, Araxi is a culinary must, serving an array of amazing seafood and oysters. Be advised though, this place doesn’t come cheap, save this restaurant for a bumper pay cheque day! 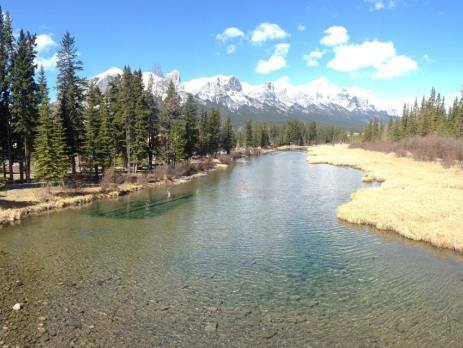 Banff and Jasper are both in National Parks in the heart of the Rockies, which offer the most picture-postcard scenery and breathtaking views anywhere in Canada. In the winter, the snow level and conditions are similar to that of Whistler; a huge quantity of light powder covering the landscape whilst looking over resorts like Lake Louise and Marmot Basin; where Oyster sends some of our applicants. In the summer however, the Rockies transform into peaks of jagged rock, icy turquoise blue lakes and seas of immeasurable numbers of tall, deep green pine forests. When in Banff, do the 2 hour hike up to the top of Sulphur Mountain which looks out over the whole town and Lake Minnewanka. The province of Alberta is named after Queen Victoria’s husband and Lake Louise are after her fourth daughter. The area is steeped in natural history. At Lake Louise itself you can see the famous Fairmont Hotel towering next to the blue lake with the mountains in the backdrop, making it a must see location in the Rockies. Jasper National Park has a brand new gondola named Jasper Skytram which takes you up to 2,277m above sea level with astonishing views to behold. You may be lucky enough to spot some of Canada’s local wildlife on the way up including bears, moose, deer, elk and beaver. Driving around the Rockies is the best way to visit all the sites you want to see. From the famous locations such as Banff, Lake Louise and Jasper to smaller resorts and towns like Field, Golden, Revelstoke, Kicking Horse and Donald. Around every corner is another amazing view, making this an awesome place for a road trip. A personal favourite is Maligne Lake near Jasper which has the most impressive landscape, three glaciers in sight and a trail all the way around the lake. The tiny Spirit Island in the middle of the lake is a landmark sight for all of the Rockies. The National Geographic has listed the Icefields Parkway, a 232km stretch of road that connects Banff and Jasper, as one of their most spectacular drives in the world. 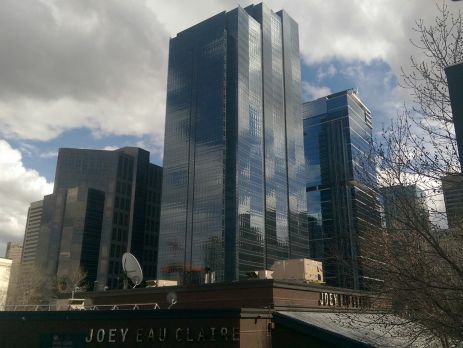 Calgary is famed for its Calgary Stampede, premium Alberta beef, low prices and hosting the Winter Olympics in 1988. The city can reach very cold temperatures in the winter of -20°C but also reaches up to 30°C in the summer. The city is only a 90 minute drive from Banff and the Rockies which means many Calgarians head up to the slopes at the weekend. The city centre is designed like many North American cities, on a grid system, and is fairly easy to navigate and remarkably clean for a population of 1.1 million! Best place to see is Prince’s Island Park, in the Bow River, just north of Eau Claire by the riverfront. It is a perfect place to rent bikes and go cycling around whilst still being very close to the city centre. The best time to go visit Calgary is July when the Calgary Stampede takes place, a 10 day event where the city goes back to the wild west! The festival has attractions and events all over the city but the highlights include the rodeo and chuck-wagon racing. If you want a day out from Calgary, an hours drive across the prairies eastwards you can arrive at a small town named Drumhella, which has a hidden gem, The Royal Tyrrell Museum of Paleontology. This relatively unknown museum, showcasing everything dinosaurs, appeals to young and old and presents some immaculately preserved T-Rex’s, Triceratops and Stegosaurus’s in one of the most bountiful fossil bearing beds in the world! Quebec is the only province in Canada to have a predominately French-speaking population, with French as the provincial language. If you want to improve your language skills, this is the place to visit. The French spoken is quite a different dialect if you are used to European French and can take some getting used to! 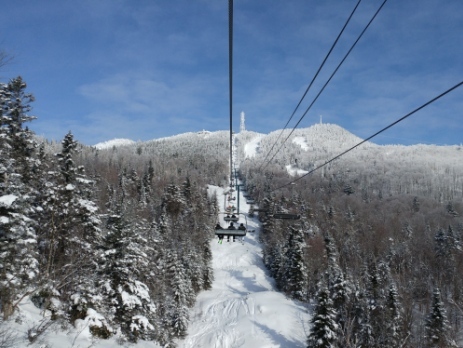 If it’s the East Coast of Canada, and great skiing, you’re looking for, then Mont-Tremblant is the place for you! Make sure you have your thick skiing gloves though; it can reach as low as -40°C here during the winter! Yet, the Quebec landscape is just as impressive as its Alberta counterpart. The altitude may not be as high but it still has some of the best skiing in North America. You can ski at the North Side of the mountain in the morning (which catches the early sun) and make your way round to the South Side mountain to finish an amazing bluebird day. The skiing has less advanced slopes than Whistler or Banff but some brilliant long gladed runs. After a long day skiing, you can head into the town which has some great local spots like the La Forge, Ya’ooo Pizza Bar, La Shack and Casey’s which have locally brewed beers and some amazing steaks and seafood. Montreal is a 90 minute drive away and is known to be the oldest city in Canada. It is packed full of historic buildings and museums, the second largest botanical garden in the world and an Old Town with a look and style akin to that of medieval Europe. France is an obvious influence with Quebecois being a dialect spoken here and French food can be found across the city. A must try dish (which is found everywhere in Canada now) is Poutine – chips with gravy and cheese curds! The nightlife hosts jazz clubs and bars scattered around the city which makes the city a totally unique place in Canada. All within a bus journey from Tremblant, it’s a must see. Canada is not a cheap country, but with the right places and careful planning you can be money-tight without being too frugal. An average night stay in a hostel in any major city like Vancouver and Montreal will cost around $15 CAD for a dorm room and $65 CAD for a private room. WiFi is found in most places and is generally free to access in most hotels, bars and cafes. If you go for a meal out in the city, expect about a $30 – $40 CAD bill on average. Some places, like Fernie’s in Vancouver and Calgary have cheaper options aimed at travellers and students, at around $20 CAD. Be advised though, you ALWAYS tip at least 15% for your meal! When renting a car in Canada, there is a surcharge added to those under 25 years of age of about $20 CAD everyday. This is sometimes included in the price from rental garages but always look for those hidden costs if not. You do not need an International License to rent a car, just a valid full driving license which you’ve had for more than a year. Price of petrol, or gas, costs a lot less than in the UK. Vancouver has gas selling for $1.36 per litre, which exchanges to 81 pence. In Calgary, prices are lower than even the average in Canada, where you can pay $1.10 per litre, which equates to 66 pence (prices correct at time of writing). This makes it even more tempting to try a road trip when out in Canada! If you drive near a native reserve site, gas there has lower tax and is even cheaper. Therefore, attempt to fill up when visiting the vibrant cultures Canada’s First Nations people. Public transportation costs are good in Canada; taking you long distances for a decent price. Oyster often use the Banff Airporter between Banff and Calgary and the Sundog Tours between Jasper and Edmonton. Many of our participants, and tourists visiting the resorts use these facilities regularly. If you move out to Canada for a long period of time, it is best to sort out a phone contract. There are a couple of major providers like Rogers and Bell which can offer deals to an unlocked phone which range from $30 – $40 CAD depending on your package. However, if you opt for a pay-as-you-go deal, instead of a contract, a great low-cost mobile phone plan could cost as little as $22 per month! Great for those who just need calls and texts on their phone. WiFi is so abundant that data is hardly necessary. Oyster help organise a trip to get your Social Insurance Number (SIN) when you first arrive in Canada . In Vancouver, for example, the Service Canada Centre in Downtown holds the applications for SIN’s which you need before you can start earning money in Canada. To qualify for this you need to make sure you have your passport and working visa with you as proof you can work in the country! This guide has hopefully helped form an idea in your mind of what to expect and places to go when moving to or visiting Canada. From east to west this country has an incredible gamut of landscapes, attractions and cities which need to be explored. For more information on programmes you can get involved in, please call Oyster Worldwide’s office on +44 (0) 1892 770771 or e-mail our Canada Destination Manager, Jon, at [email protected].